In celebration of National Curry Week I have created this unusual twist on an Indian classic – my delicious and oh so easy Chicken Tikka Masala Traybake. Better still, roasting things in the oven often gives them a better flavour and sometimes even a better texture than cooking them on the hob. That is most certainly true in this dish. 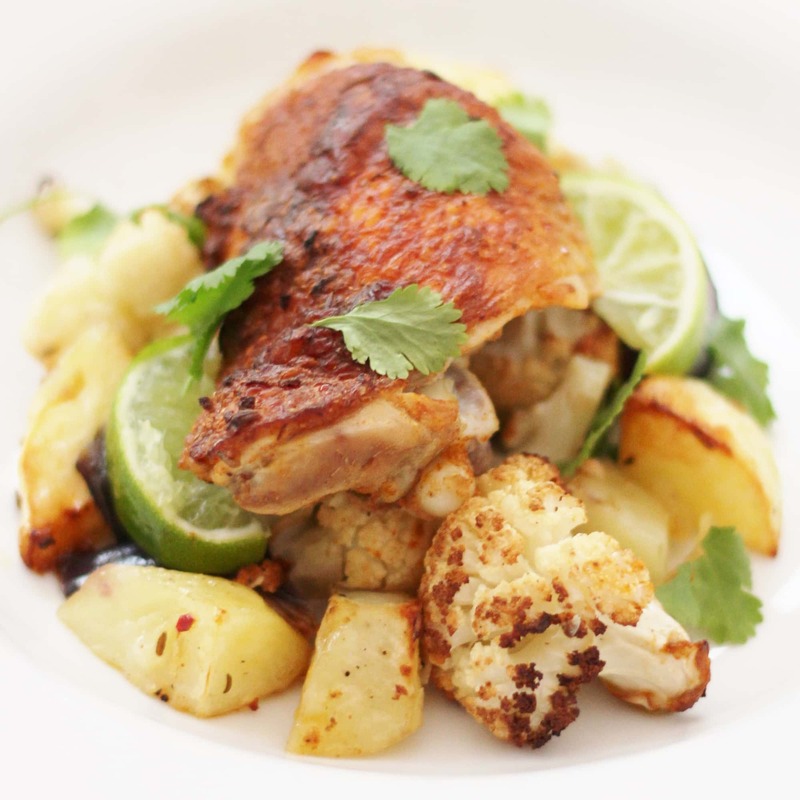 The slightly charred, roasted cauliflower is infinitely better than its boiled cousin and the crispness of the chicken skin just wouldn’t be possible by any other method – and I really don’t need to tell you how wonderful potatoes are when roasted, now do I? Not only am I a huge fan of traybakes, but I am also a big fan of curry – I’ve made a fair few recently – as I am sure my regular readers will attest to! I’ve talked before about how curries, for me, are the perfect mix of easy, healthy and delicious – but usually I make curry in fairly conventional ways, either on the stove top or slow cooked in the oven – I’ve never tried a curry traybake before…until now! It’s been an idea I’ve had niggling away at the back of my mind for some time, though, so I thought I’d better get on with it – especially given that this week is National Curry Week! 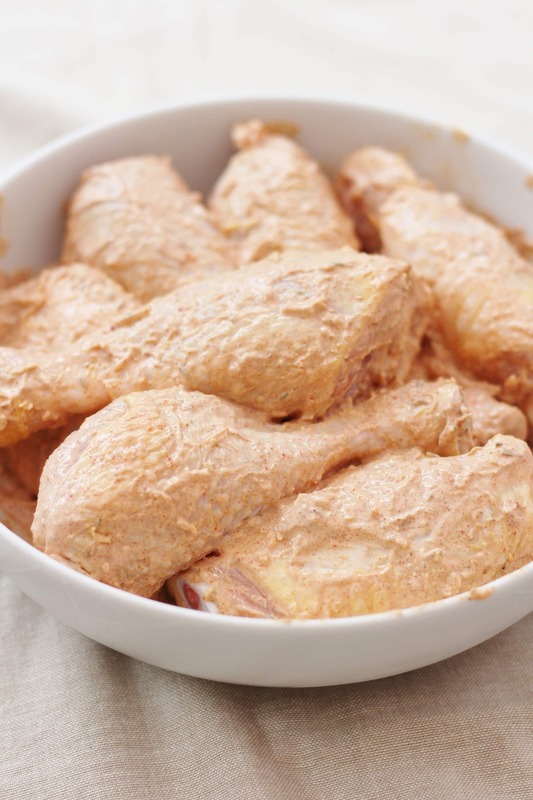 I decided to go with a simple tikka masala type marinade for the chicken and use one of my favourite cuts of meat – chicken thighs, as they work so well in this meal – I also threw in some chicken legs too. I just knew the marinade on that lovely crispy skin would work so well, but then the question was – what else should I put in the tray? 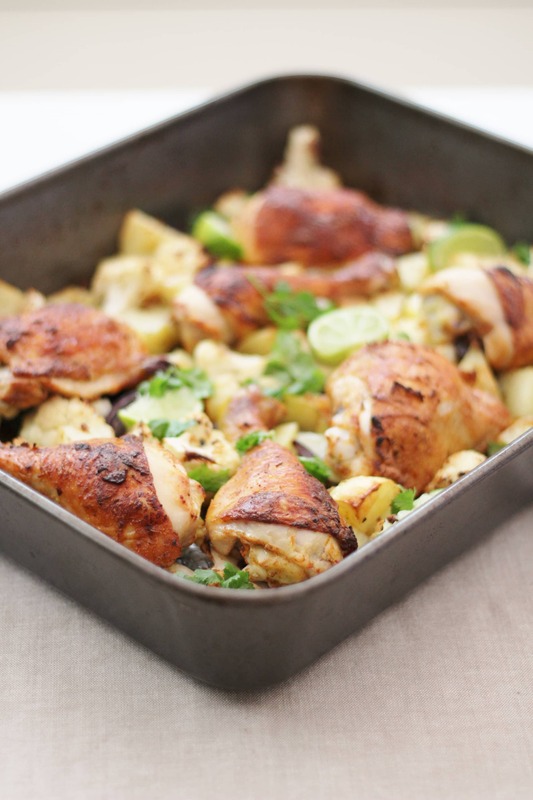 This simple traybake is a meal in itself and really needs no extra accompaniment, however if you want to, you could serve it with some naans or rice and all your favourite pickles, chutneys and raitas and turn this dish into a feast! Wine wise, I think this would be brilliant with a vibrant Sauvignon Blanc from Chile or NZ. My husband would always have a beer with curry! He suggests a crisp, refreshing lager such as Goodwood Sussex or Anchor Steam Beer. Mix all the ingredients for the marinade in a large bowl. Add the chicken and coat thoroughly with the marinade. Ideally marinate the chicken for an hour or two but if you haven’t got time continue to the next step. 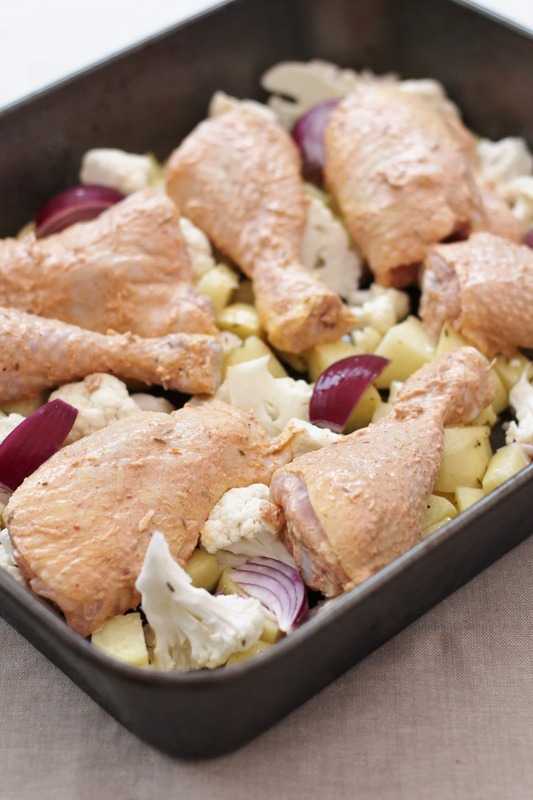 Prepare your cauliflower and potatoes and place in a large roasting tin. Sprinkle over the cumin, salt and olive oil and mix together thoroughly so the veg is evenly coated. 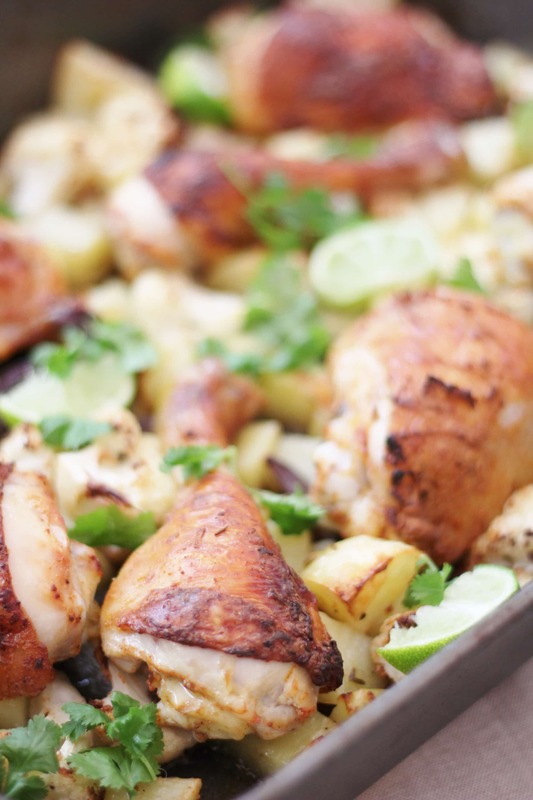 Remove the chicken from the marinade and wipe off any excess – the chicken should only have a thin coating of marinade. Place the chicken pieces skin side up on top of the veg. Place the tray in your preheated oven and roast for 20 minutes. 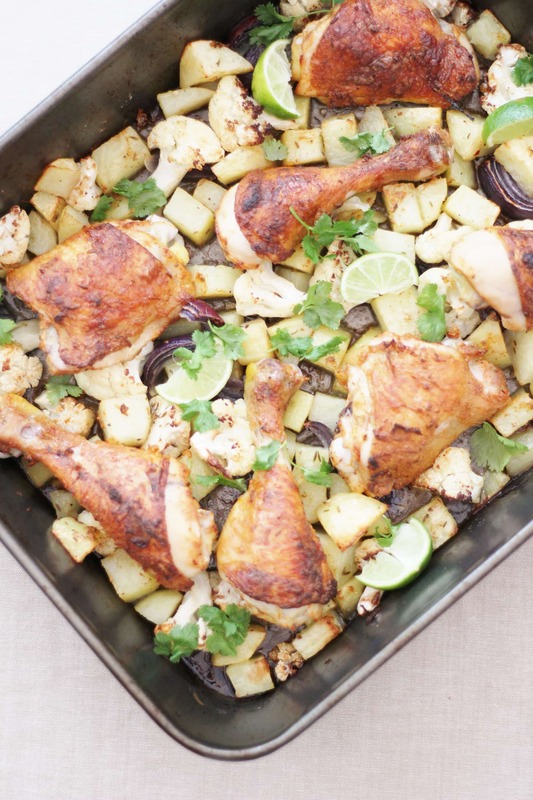 After the final 20 minutes, remove the tray from the oven and scatter with the lime quarters and fresh coriander. Serve at the table, either on its own, or with rice/naans and all your favourite chutneys, pickles and raitas. I am linking this up to Brilliant Blog Posts, Cook Blog Share, Recipe of the Week and The Food Calendar. What a fab idea for a traybake! 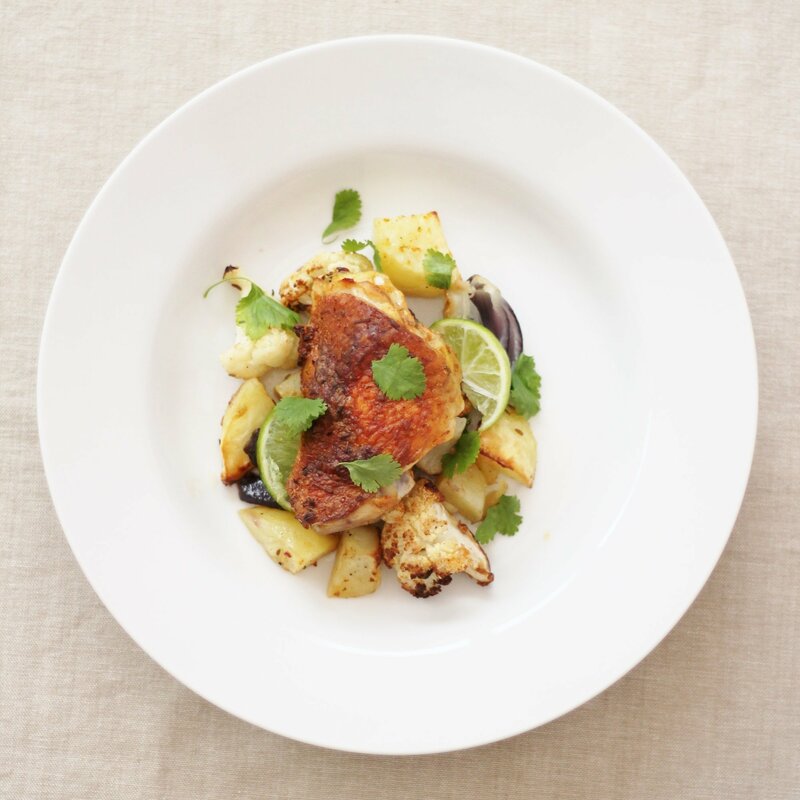 I often roast the veggies to add to a curry too – love the flavour and texture that you get doing it that way. I reckon coconut milk yoghurt will be amazing in this!! Traybakes make such easy work of dinner time, don’t they? I really love how you’ve got all the flavours of a curry in here and cauliflower is most definitely better roasted than cooked any other way! 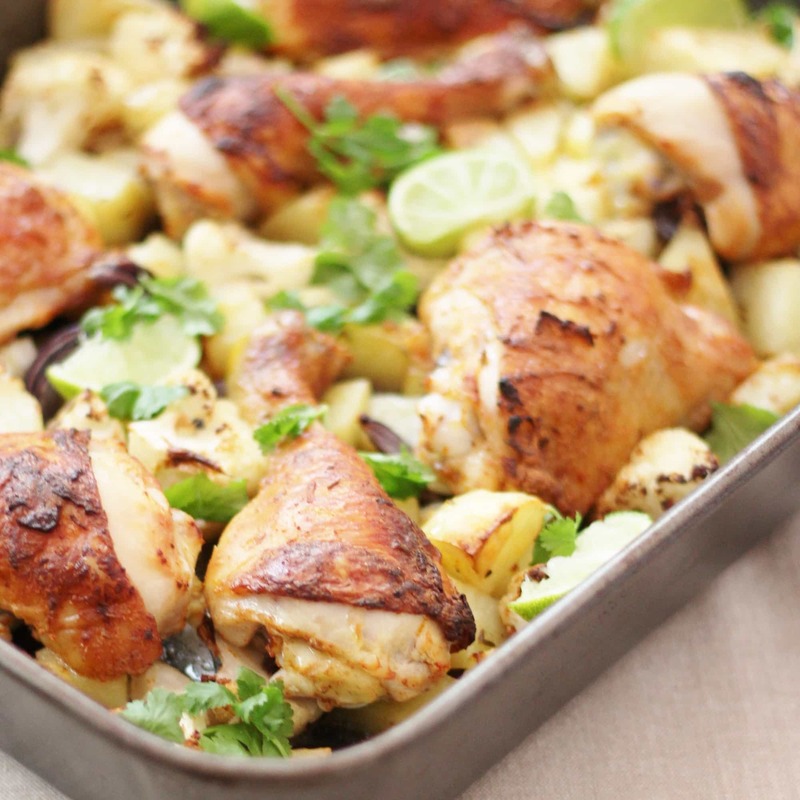 I love the idea of a curry traybake (although I’m surprised that you made one because traybakes aren’t really your sort of thing 🙂 ). I’ve got my thinking cap on now for my own version, in the meantime I’ll have to give this a go.